Paradise Palm Pools did a great job on our pool deck remodeling. John was simply the best. Paradise Palm Pools in Tampa Bay specializes in pool deck remodeling and deck renovations to your existing swimming pool. Remodeling and renovations include vinyl liner replacement, adding new steps, adding a new spa or hot tub, deck renovation, screened patios and more. Let our team of professionals build the pool deck of your dreams. 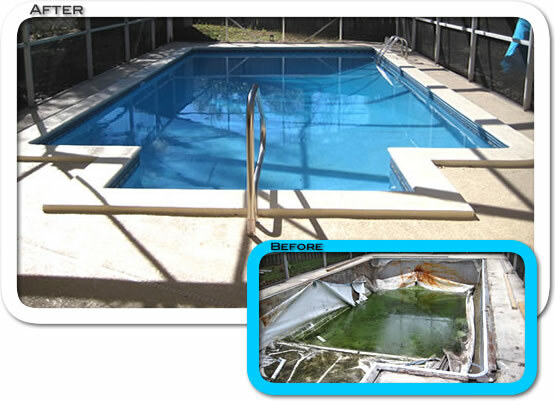 Paradise Palm Pools in Tampa Bay specializes in deck remodeling and deck renovations to your existing swimming pool. Remodeling and renovations include vinyl liner replacement, adding new steps, adding a new spa or hot tub, deck renovation, screened patios and more. As a Pacific Pools and Fox Pool Authorized Dealer, we offer a full line of vinyl liners and accessories. We will repair or replace your old pool deck with a new concrete or patio pavers deck. Service areas include Tampa Bay, St Pete, Clearwater, and Sarasota. Now serving new pool construction, repair, and new vinyl liner replacement for 32420, 34241, 34238, 34243, 34689, 34688, 33647, 33619, 33610, 33626, 33762, 33756, 33755, 33761, 33764, 33510, 33511 and more.